Images : multi23.se. Multi23.com. Sent by Philippe MALLEJAC / Torpen Inernational Boats. 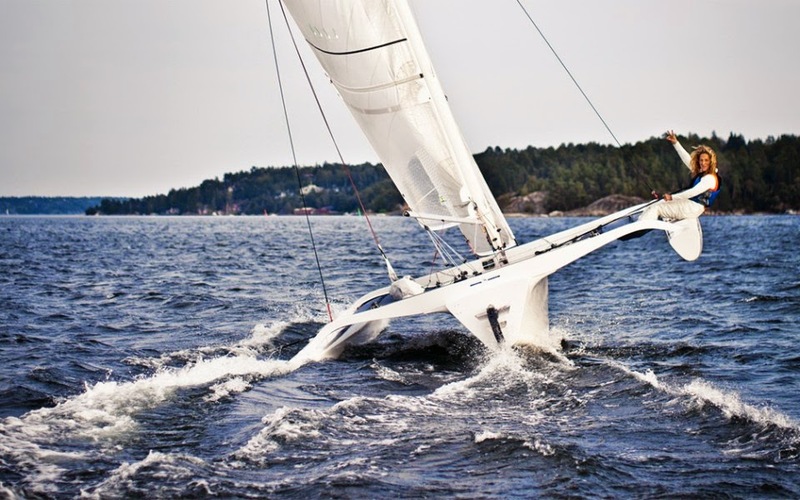 "For those who still don’t know yet about the Multi 23 trimaran, she is a kind small amazing replica of the famous Maxi Trimarans “Orma 60”, but only 6,72 m long, both designed by the renowned naval architects firm Van Peteghem Lauriot Prévost (VPLP) and built by the French shipyard “Torpen International Boats” up to more than 90 boats sailing worldwide, and… she is about to make her revolution! The shipyard announced the launching of the Multi23 MKII version, whom received a lot of improvements. This new version is still built using infusion technology and high quality materials (Epoxy, carbon, vinyl ester, PVC foam core, …), which make her very light, but she receive now more reinforcements in carbon such as the beams 80% carbon and wherever it was necessary. This new version of Multi 23 is more stiff, more responsive and faster than the previous one, she starts flying even in the slightest breeze! 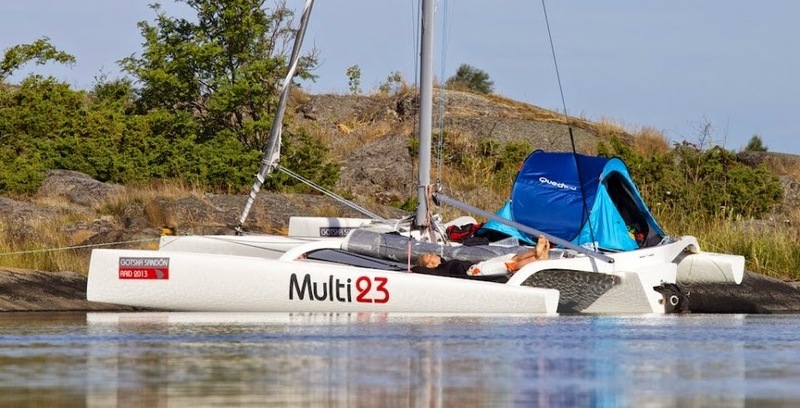 Standard Multi 23 is still delivered with completely sufficient rigging of 3 sails (Mainsail with 2 reefs, Self Tacking Jib, Genaker). 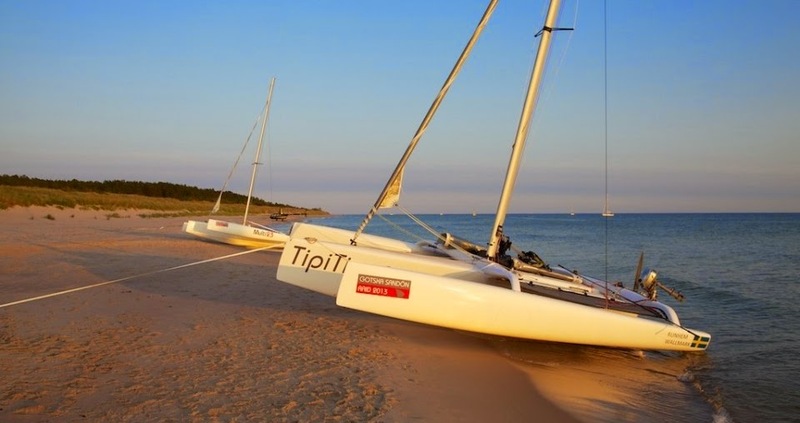 The Optimization of rudder system (100% carbon now) and the retractable centreboard, particularly by increasing strong carbon structural reinforcements, gives them reliability to withstand the forces generated by high speeds over 20 knots allowed by the design of the platform. Mast travelers allow effortless hoisting of the mainsail and add safety by controlling dowsing, even on the run, in case of reefing or simply when approaching to the mooring place. Raising up the Main becomes a child’s play! Superb 100% Carbon Bowsprit for those requesting the asymmetric Spinnaker. 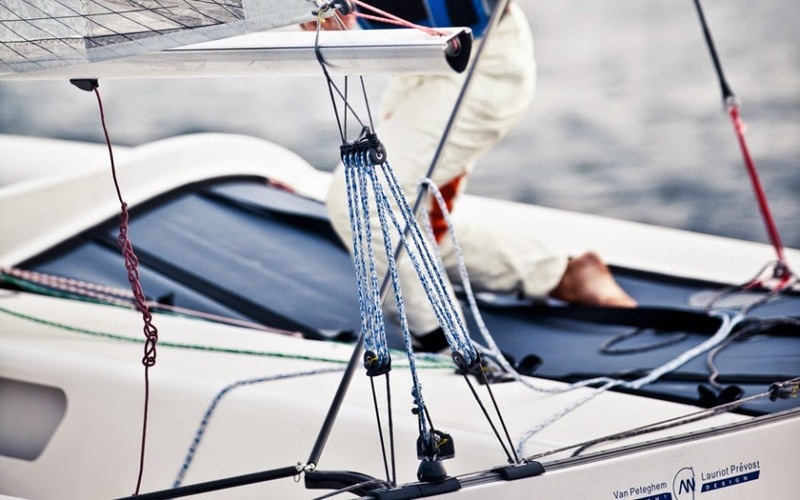 All on board is high quality equipment: the hardware are signed “Karver Systems”, including Jib & Genaker easy furling systems and a very well ingenious Single Jib sheet, crossing through the main beam and mounted on a 180° swivel cleat tower. We appreciate the optimization of the operating commands wherever you are on the platform, the solo sailors will be really delighted! Pure and unimaginable sailing sensations, we love it!"